Well, this was the first thing I thought of when I read that. Yes, I made Mexico a girl just so I could make this joke. Israel: "A-America?!" *falls to knees and starts sobbing* "I THOUGHT WHAT WE HAD WAS SPECIAL!!!!" New headcannon/AU that America really IS gay and Mexico knows and has agreed to fake date him to hide it. This is also why he's so homophobic. @ImTheDevilDog I frankly like this headcannon! But if we continue the geographical look, Panama, Belize, Nicaragua and the others would be the neck and South America would be his body and for most cases, Brazil would be his chest. 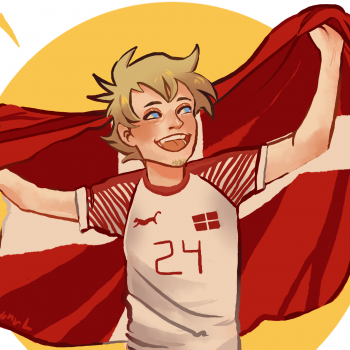 The artist has admitted that Scandinavians know nothing about Latin America. 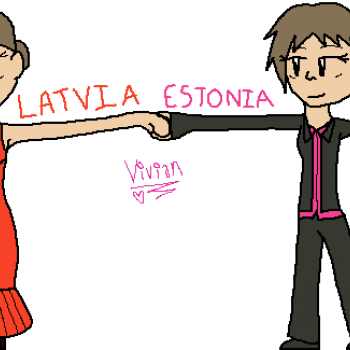 (They don't even remember Estonia exists, and she's right there!) So comics about Latin America are going to have to be a spin-off. Maybe Mexico is America's skinny jeans. @VanessaLeskinen That explains the cereal box wall in the comic strip with the three Scandinavian countries making fun of each others' languages. Beard? I never thought of it that way.